Tuesday 25th November, 2014 – Honda Motor Co., Ltd. today announced that Honda's cumulative worldwide motorcycle production reached the 300 million-unit milestone in September 2014, and held a ceremony at Kumamoto Factory, Honda’s primary motorcycle production plant in Japan, to commemorate this remarkable milestone. 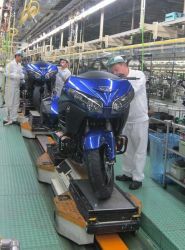 A Gold Wing 40th Anniversary Edition produced at Kumamoto Factory became the 300 millionth motorcycle that Honda has produced globally. The 300 million-unit milestone was reached in the 66th year since Honda began motorcycle production in 1949 with the Dream Type-D. The history of Honda’s motorcycle business began with the start of mass-production in Japan in 1949. Production outside of Japan began in Belgium in 1963, and since then Honda has been expanding its local production to many countries around the world based on Honda’s commitment to “build products close to the customer.” With a longstanding passion to create technologies that make people’s lives more convenient and fun, Honda has been developing and offering products that accommodate the diverse needs of customers in a large number of countries and regions around the world. Having grown into a brand beloved by many customers around the world, Honda is currently producing motorcycles at 33 plants in 22 countries, sharing joys with its customers. Honda will continue offering products which fulfil the needs of its customers around the world. Takanobu Ito, President and CEO of Honda Motor Co., Ltd. Founded in 1948 by Soichiro Honda, Honda is the world’s largest engine manufacturer. Since 1986, it has been actively involved in robotics, and released the first ASIMO humanoid robot in 2000. In 2006, Honda announced its plan to enter the aviation market with a compact business jet aircraft. The HondaJet is now entering the final stages of certification process. In 2013 Honda sold 16.8 million motorcycles worldwide, an increase of 8.7% compared to 2012. It has been the world’s largest motorcycle manufacturer since 1959. The Honda Super Cub is the most-produced motorcycle in history. Cumulative worldwide production reached 87 million units in March 2014. It has been sold in more than 160 countries. The Honda Gold Wing celebrates its 40th anniversary of production in 2015, This milestone is being commemorated with a Special Edition colour scheme for the GL1800 Gold Wing. Honda has an unequalled record of success in motorcycle racing, having won 21 Constructors Titles in the premier class (known currently as MotoGP), 63 Constructors Championships and 697 races across all categories in the premier class. 21 year old 2014 MotoGP champion Marc Marquez won a record 13 Grand Prix in the 2014 season. Over 30,000 motorcycles equipped with Honda’s unique Dual Clutch Transmission have been sold in Europe since its introduction in 2010.